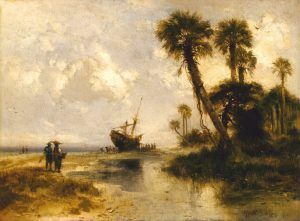 Fort George Island was called Alicamani by the Timucuan Indians who were living here when French explorer Jean Ribault landed nearby at the mouth of the St. John´s River in 1562. Later it was occupied by the Spanish and then by the British. In 1736, the British founder and Governor of Georgia, James Oglethorpe, built a fort on the island and named both the fort and the island “St. George.” The fort was established to defend the southern flank of Georgia when it was a colony. Oglethorpe also wanted to attack the Spanish garrison at Castillo de San Marcos in St. Augustine, Florida. The fort was an earthwork with a palisade post situated somewhere near Mt. Cornelia. The post was abandoned after the failure of the Siege of St. Augustine during July and August of 1740. Afterward, the island became home to a number of large plantations. There are no remains of the fort today.